Most reviews I write after a single visit – and try to capture our experience as a family, however much or little we see of a place. My inner museum professional is affronted by these seemingly ‘imperfect’ visits where tiredness, hunger and dirty bums encroach on our time. Kids, we haven’t read ALL the text panels – or looked at all the displays! But as I’m reviewing for families hopefully just as imperfect as me, I regularly fight the urge to revisit places to do them ‘properly’. However for this review, of the Small Stories exhibition at the V&A Museum of Childhood, my inner perfectionist demanded a revisit. Our first visit was a hastily made plan B, after arranging to meet a friend at another museum – on the only day it closes in the week. Oops. A coffee and catch up was essential after that mishap, with a play in the sandpit followed swiftly by lunch. 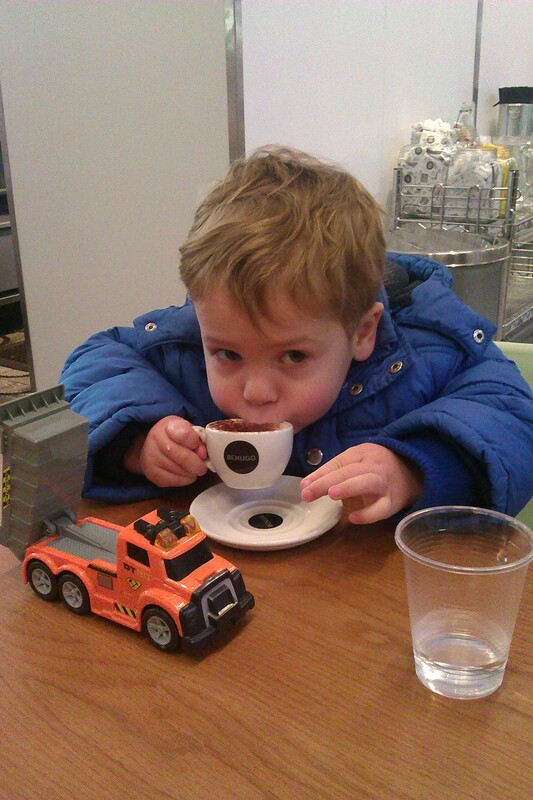 It’s baby- sorry, toddlerccino time! By the time we made it to Small Stories, it was a little too late in the day for my liking. 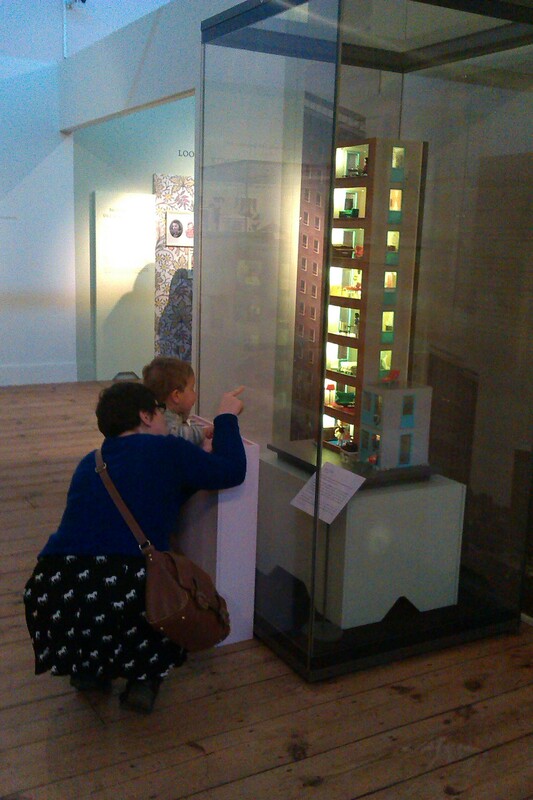 At first Small Stories appears like a simple exhibition – twelve dolls houses from different eras and dolls that tell stories. Boom. The dolls houses range in age, size and style – from a large country pile made out of an early hanging wardrobe 300 years ago, to a brightly coloured perspex open plan 21st century home. 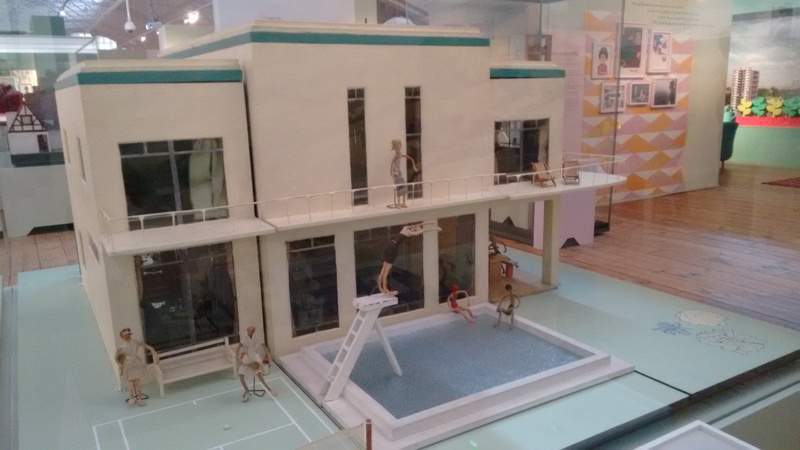 With a Victorian terraced lodging house, a post Second World War tower block, and mid-twentieth century council house also on display, it’s like a brief history of British architecture – in miniature. Each house is displayed complete with furniture, furnishing, and accessories, right down to a set of little toy bowling pins in a playroom. 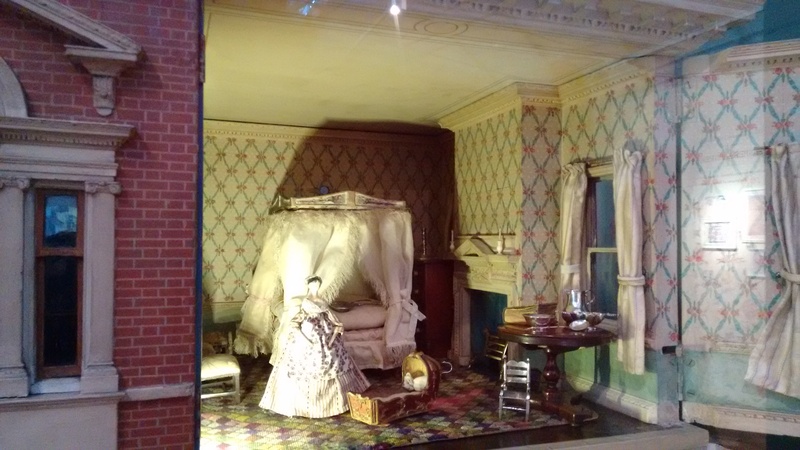 You can turn on the lights in each dolls’ house to get a better look – and the toddler certainly enjoyed pressing the buttons. All in all there are a dizzying 1,800 miniature objects and 107 dolls on display – many specially conserved for this exhibition. Having worked on exhibitions before, my mind boggled thinking of how long it must have taken to put all this together! My favourite house was the Art Deco home complete with outdoor swimming pool and strangely lithe dolls. I can just imagine the cocktail glasses chinking whilst the jazz blared out of the gramophone. 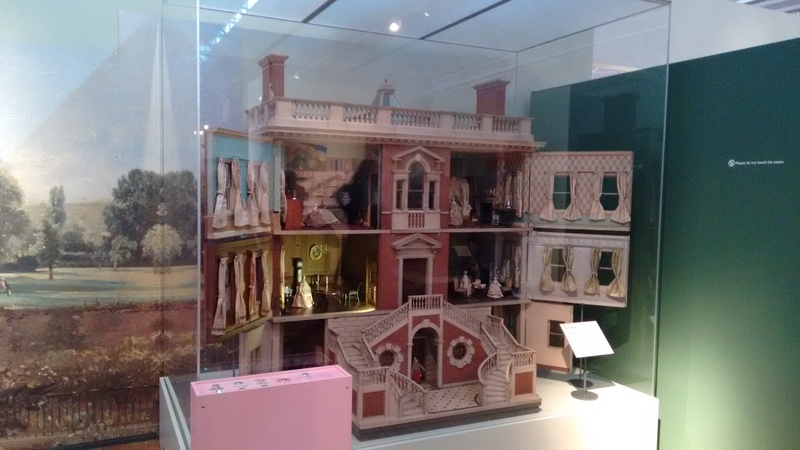 I liked the information given about the original makers and owners of each the dolls houses – it gave such a personal insight into each of them and I could really imagine them in people’s homes, rather than in a museum. It was interesting to see how many were made by women in their adult years as reflections on their childhood years (like Amy Miles’ house), or as a space where perfection is possible (Betty Pinneys’ house). 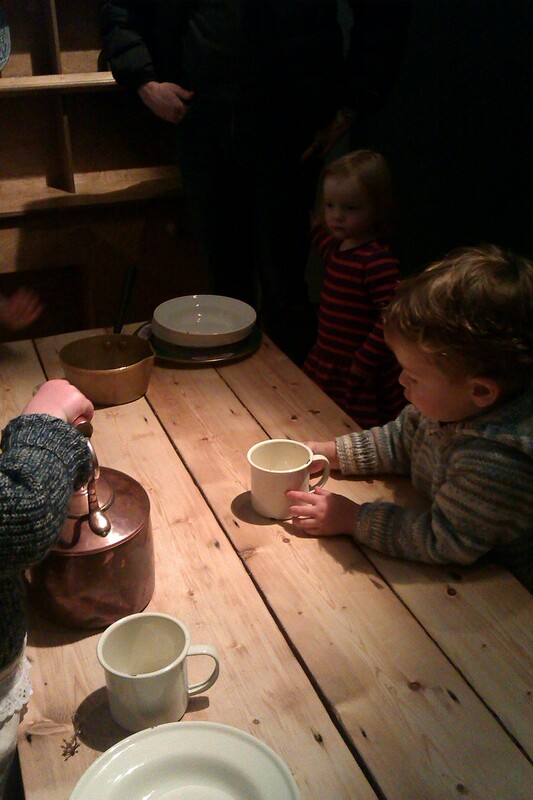 The toddler enjoyed the playspaces, particularly the kitchen. Here he grumpily grabbed metal plates and banged them on the wooden table, like a put-upon footman from Downton Abbey. As well as a being fun I loved the way it had been designed to look like a blown up version of the dolls’ house just outside. There was also a play living room, all kitsch and 1960s, just like the tower block we’d been looking at a minute before. 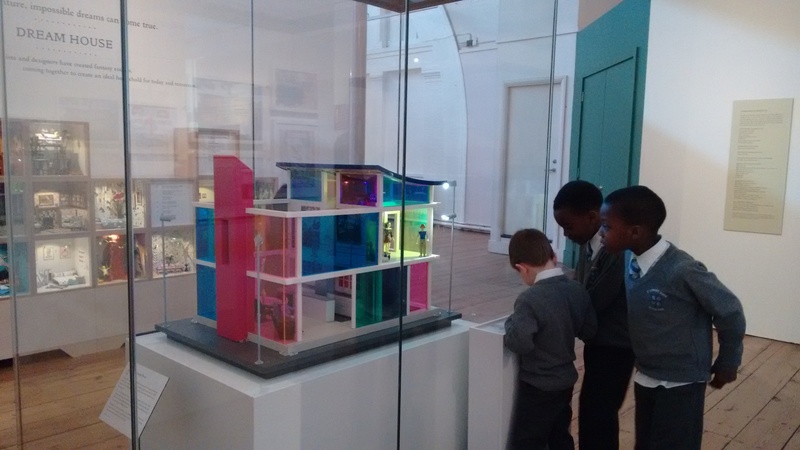 The tweenager particularly enjoyed Dream House – a 20 roomed dolls house with each room made by a different artist or designer. 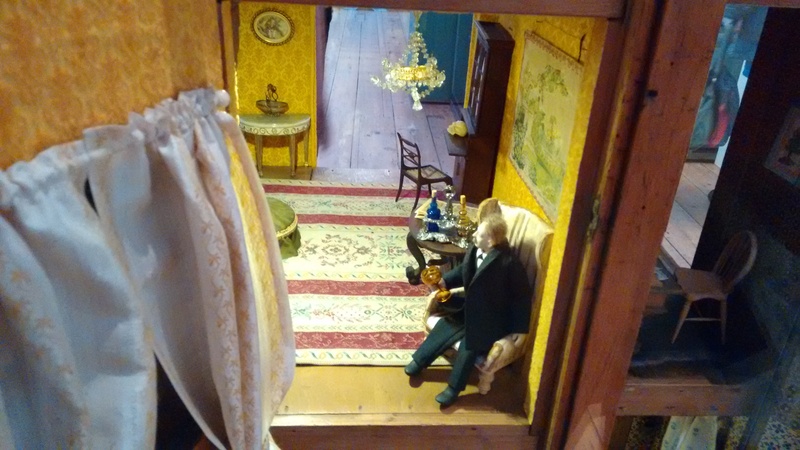 Bright and creative, and really highlighted how doll’s houses are not just reproductions of homes in miniature, but also represent an imaginative playspace. 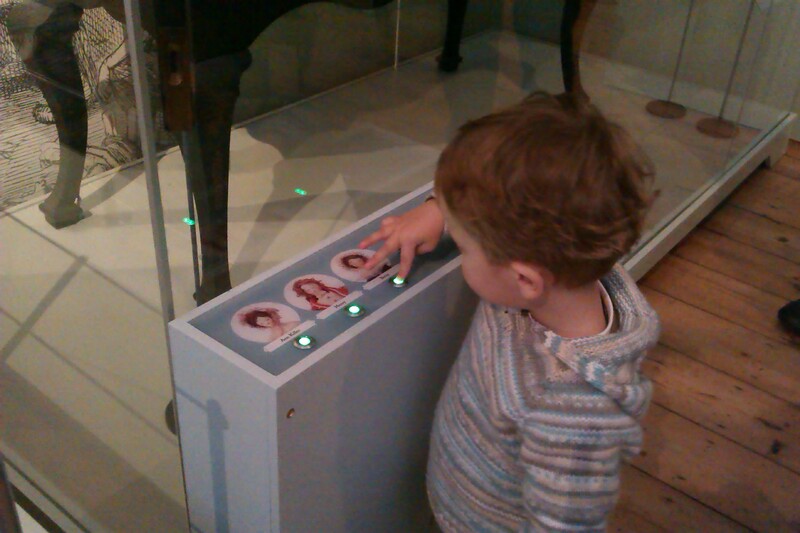 Each house also had a button to press to hear the dolls speak. As the exhibition was quite busy, you couldn’t really hear the audio very well – in fact we assumed they were broken as they seemed unresponsive. Although we still enjoyed ourselves, I knew there was more to Small Stories than I could appreciate with a nap deprived toddler so decided to revisit – and I’m so glad I did! As I was sans tired toddler on my second visit, I had plenty of time to read those pesky text panels and listen properly to the dolls’ stories. I found out that the audios were all working – but as you can only have either all lights or the story character (and corresponding light) on at a time – and they WILL NOT be interrupted, even if you do change your mind and want to hear someone else. Or just randomly hit buttons like the toddler. I started to see the houses differently – as somewhere less idyllic, requiring upkeep, a place of work, a public entertaining space, that demanded something of all the residents. Many of the dolls were stressed out. Poor Betsey the maid in the Killer Cabinet House was worried about keeping the place clean, what with living in a dirty town during the Industrial Revolution and all. Sir Phineas Henriques was convinced his man servant was stealing from him, whilst in the early twentieth century home the ‘servant problem’ was finding staff in the first place. One story which really struck a chord was Johanna’s in the Tate Baby House, anxiously writing a letter to her mother whilst big-bellied and awaiting her two week ‘confinement’ to bed. Whilst I would have liked a bit more rest post-birth, I think keeping me in bed for a fortnight would have sent me over the edge! There were also elements of great humour – keep an eye out for drunk Uncle Herman, looking and sounding like something out of the Fast Show in Betty Pinney’s House. 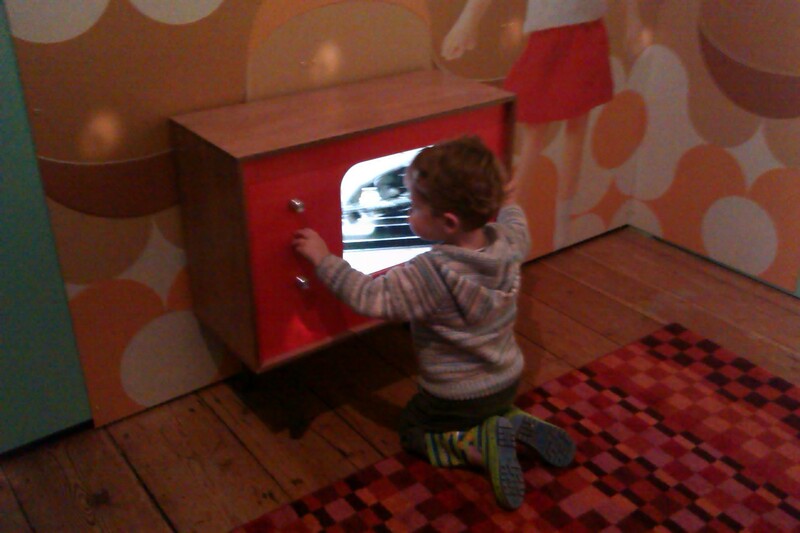 Judging by the other visitors I saw enjoying and engaging with the objects, this really is an exhibition for all ages. Your kids will like it, your parents will love it – and you’ll be won over too – especially if you get a chance to see it ‘properly’. PS I’ve just joined Instagram – feel free to follow me on @museummum if you want to see pictures of this and other exhibitions, as well as snapshots of my daily life. 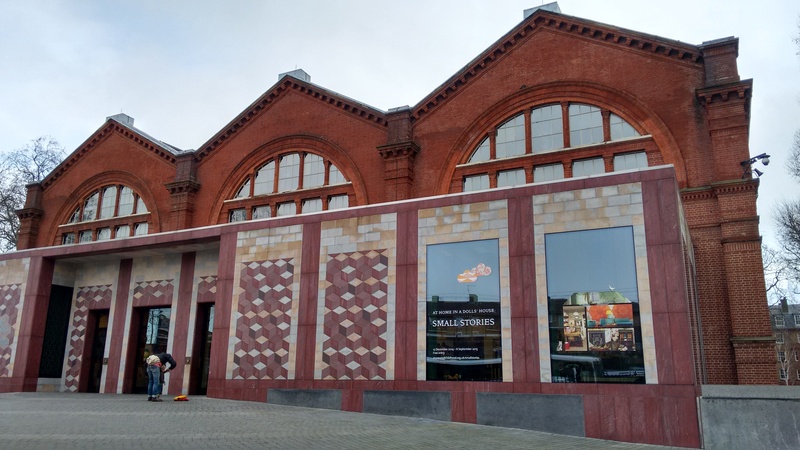 Further details, including buggy accessibility, baby changing, and suggestions on making a day out of it are available on my review of their last exhibition, Jacqueline Wilson. A set of my painted pegs is in the box to the bottom left of your toddler’s head! – In the dream spaces boxes. I’ve yet to visit them in person! You’re only adding to my anticipation. Apologies, not been keeping on top of my comments! They are great, I love the dream spaces – bet you enjoyed making them too. Hope you enjoy seeing the finished piece – let me know what you think!